1. Heat the olive oil in a Dutch oven or large wide pot over medium-high heat. Add the celery, onion, poblano pepper, carrots, ½ teaspoon salt and pepper. Cook, stirring occasionally, until the vegetables have softened, about 8 minutes. Add the garlic powder, onion powder, chili powder, cumin, garlic, tomato paste, sugar and cook, stirring, about 2 minutes. Remove to a small bowl and set aside. 2. Using the same pan, add the turkey, turkey sausage, ½ teaspoon salt and cook, breaking up any clumps with a wooden spoon, until brown, about 8 minutes. 3. Return the vegetable mixture to the pot and add the diced tomatoes, all the beans, green chiles and chicken broth. Continue cooking at medium-high and bring to a simmer, then reduce the heat to low and simmer until the flavors have melded, about 30 minutes. 4. 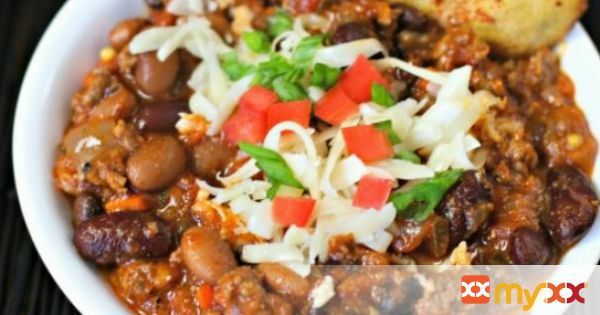 Serve the chili topped with cheese, sour cream and scallions. And, don’t forget the Sweet and Savory Cornbread Cookies!